The surprises are coming fast and furious today. Just over a day after Qualcomm announced their second device partner, they pulled a third partner out of their hats. This time around it's Hanvon, and I'd like to take a moment and point out that I predicted this last year. The new device looks to me like it's another Qualcomm reference design. It has a number of details in common with the Kyobo eReader and the Bambook Sunflower. The C18 bears a more than superficial resemblance to Qualcomm's first design, but it's a lot thinner and lighter. That makes it a lot easier to hold. In addition to the microSD card slot and headphone jack on the bottom edge, the C18 has a speaker on the back. This design also has the power button in a different location. According to the press release, the C18 is running on a SnapDragon 1GHz CPU, and it's running a custom Hanvon reading app on top of Android v2.3. Like the Bambook Sunflower, the C18 is going to have a number of apps and the demo unit even had an app store already installed (GoMarketHD, see the photos). There were also several office apps, a music and what I think was a video player, TaoBao, web browser, FM Radio, several games, and (to my surprise) Spare Parts, an app used to tweak hidden setting on Android tablets. That last might suggest that this isn't a production firmware; it's someone's development device (there's little reason to put Spare Parts on a locked down Android device, IMO). Now, no one from Hanvon was on hand to answer questions, so I'm still somewhat in the dark about some the C18's abilities. 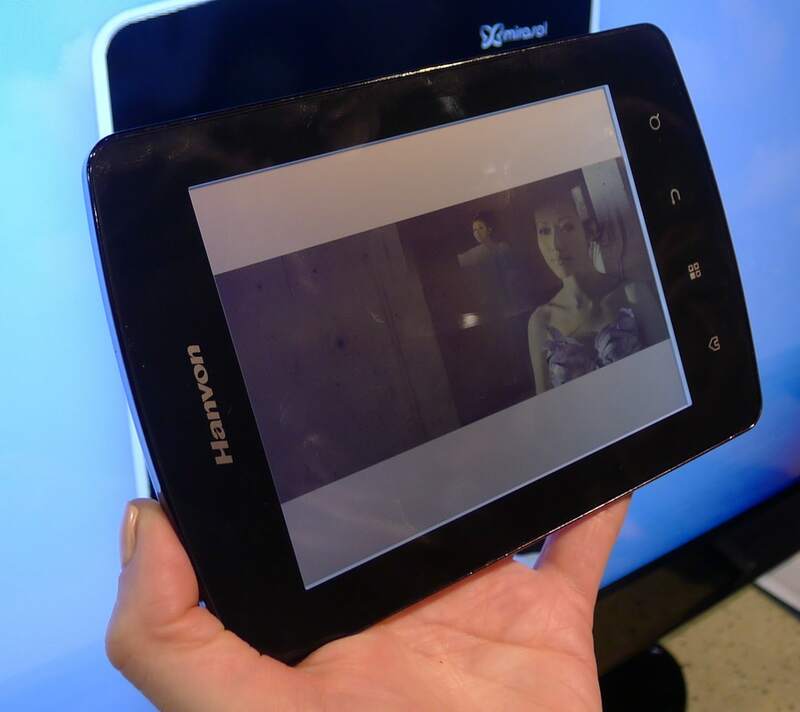 While there are a couple Hanvon people at CES and they have a booth, they're not from the ebook reader division. They are at CES to show off the Hanvon's graphics tablets, and they were only responsible for carrying the demo unit with them from China. I couldn't really judge the performance; it had to go away and be used in an interview. But I did notice that it has the same screen quality as on my unit, and it displayed the same jerkiness and visible screen wipes when playing video. Hanvon is a great partner for the Chinese ereader market; they're the dominant player with over half the market. They also have one of the larger and more popular ebookstores in China, with more than a million titles available (based on most current data). But China is also a relatively small ereader market, with around 300k ereaders sold in Q3 2011. The C18 is scheduled to be released in March in China, but there was no word on the price.